Employees of Arunachal Pradesh State Cooperative Apex Bank donated their one day salary to Chief Minister’s Relief Fund (CMRF )as a goodwill gesture. All 368 employees of Arunachal Pradesh State Cooperative Apex Bank donated their one day salary to Chief Minister’s Relief Fund today as a goodwill gesture. A delegation of Arunachal Pradesh State Cooperative Apex Bank led by RWD, IPR, Printing and Parliamentary Affairs Minister Bamang Felix called on Chief Minister Pema Khandu at the later’s office here this afternoon and handed over the cheque of Rs. 1,37,822/-. The Apex Bank employees thanked the Chief Minister for sanctioning the head office building at Naharlagun. 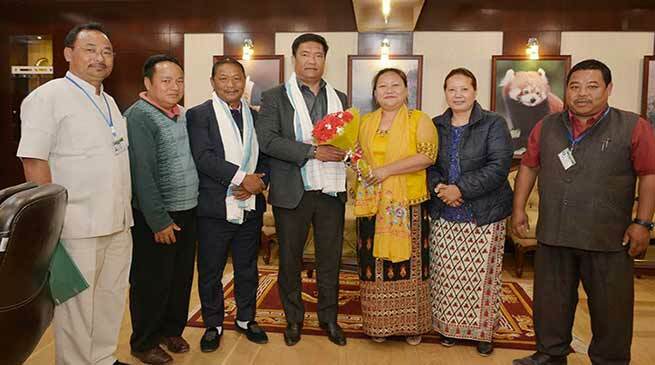 They said that it was during his father Late Dorjee Khandu that the sick Apex Bank could be retrieved and it is during his term that the Bank is getting a new head office building. Donating one day salary to CMRF was a thank giving gesture from the employees of the State’s own Cooperative Apex Bank. During the discussion, the employees pleaded Khandu to park Government funds meant for development, salary and students stipend in the State owned Cooperative Apex bank so that it could maximise the business transaction. Chief Minister Khandu assured that the matters putforth will be looked into in due course of time.